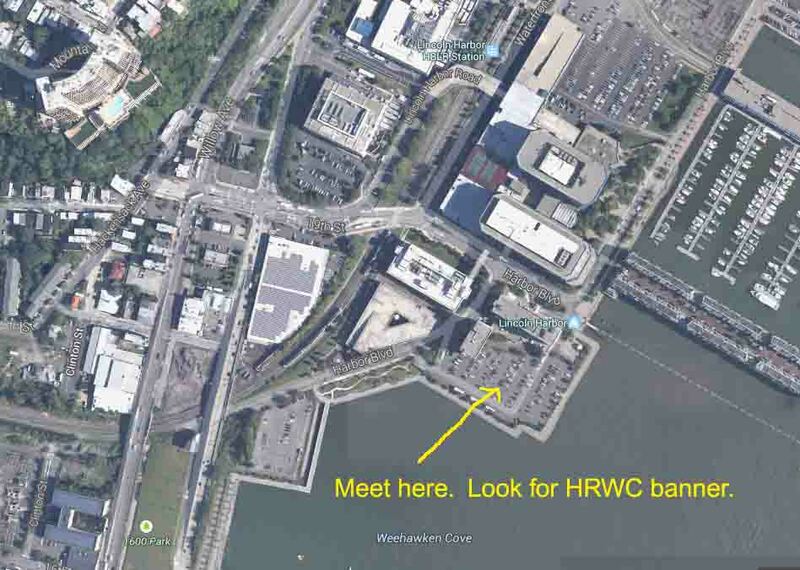 Meet: 9:00AM at the Sheraton Hotel, 500 Harbor Blvd., Weehawken 07086. Look for the HRWC banner. Directions to: The Sheraton Hotel. Take the NJ Turnpike to Exit 16 toward the Lincoln Tunnel on Rt. 495. Take the last exit, Weehawken/Hoboken, from Rt. 495. At the first traffic light, bear right onto Pleasant Ave and take an immediate left downhill on S. Marginal Hwy. Go to the bottom of the hill and turn right onto JFK Boulevard East. Continue down the hill to the third traffic light. Turn left into Lincoln Harbor at Dykes Lumber and continue straight over the Light Rail tracks. The Sheraton Hotel is on the right. Turn into the parking lot and meet at the rear of hotel. Nearest Light Rail Stop: Lincoln Harbor, Weehawken. Turn right after leaving the Light Rail Station and walk along the path to the traffic light, 19th Street. Turn left and wlak toward the river. The Sheraton parking lot is on your right after you pass the hotel. Walk Description: This walk begins at Weehawken Cove which was formerly Todd shipyards and also the place where Henry Hudson docked his ship, the Half Moon in 1609. The cove connects Weehawken and Hoboken. Hoboken has recently turned this once blighted area into beautiful park areas. Walk past the previous sites of Lipton Tea and Maxwell House Coffee. Both of these sites are now high end condominiums. Pass Union Dry Dock which is still a working dry dock facility, a skateboard park and a fishing pier, owned by Stevens Institute but leased to Hoboken as a public parkland, and enter a section of Walkway that is over the water and also part of Stevens Institute. Next comes the magnificent Hoboken park area where two large piers have been converted to public parks. The walk ends at the historic Hoboken Train Terminal where the Walkway goes through the Concourse of the Erie Lackawana Terminal and emerges to the east of the Light Rail Station going toward Jersey City.